Tsui Hark’s (徐克) new film for the Christmas season, The Taking of Tiger Mountain <智取威虎山3D>, released special behind-the-scenes footage online. 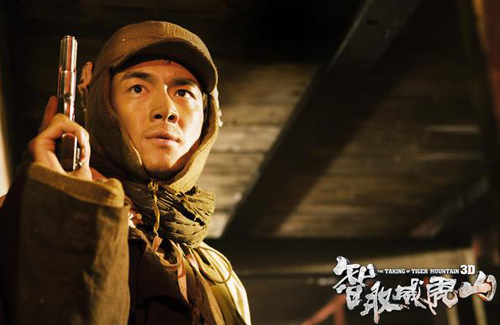 Starring Zhang Hanyu (張涵予), Lin Gengxin (林更新), and Tong Liya (佟麗婭), the film is adapted from Qu Bo’s (曲波) popular novel Tracks in the Snowy Forest <林海雪原>, which itself is based on a true story. The film tells the story of a young group of rural heroes who attempt to overthrow a team of local bandits. Recently, a press conference was held for the film, in which the cast members unveiled the special footage “Youth 203” to the audience. The cast introduced themselves as team 203 and expressed that each member of the team had different talents and responsibilities, adding a superhero touch to their roles. Bona Film Group president Yu Dong (于冬) and producer Huang Jianxin (黄建新) expressed that The Taking of Tiger Mountain aims to be the year’s most entertaining family film of all ages. “Director Tsui Hark is the producer of visuals for the Chinese film industry. The Taking of Tiger Mountain will definitely surprise everyone.” He teased that the film will include something that is unprecedented by the audience. The Taking of Tiger Mountain also stars Yu Nan (余男), Miu Tse (謝苗), Chen Xiao (陳曉), Han Geng (韓庚), Gao Hu (高虎), and a special appearance by Tony Leung Ka Fai (梁家輝). The movie will open in theaters on December 24, 2014. Very happy for Lin Geng Xin. Since BBJX his career jump from TV to movies has been non stop and and so far collaborations are almost always with big directors and productions! Looks like leaving TangRen was a brave good move for him !